The House and the Senate were poised to pass a sweeping financial reform measure this week and send it to the president's desk, but the death of Democratic Sen. Robert Byrd of West Virginia could delay the final votes on the bill. 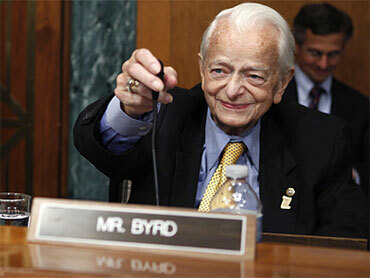 Byrd, Congress' longest-serving member, died at the age of 92 early this morning. While the senator's health was fragile for several years, his vote has proved critical for Democrats, who since the death of Sen. Ted Kennedy last year have been one vote shy of a filibuster-proof, 60 vote majority. With Byrd's death, it is now unclear whether Democrats have enough votes to overcome a Republican filibuster to pass financial reform. Four Republicans -- Sens. Scott Brown of Massachusetts, Olympia Snowe of Maine, Susan Collins of Maine and Charles Grassley of Iowa -- helped pass an initial version of the bill in May, and three of them (excluding Grassley) voted for "cloture," which closes debate and ends a filibuster. Two Democrats -- Sens. Maria Cantwell of Washington and Russell Feingold of Wisconsin -- voted against cloture and the bill. Given that Cantwell and Feingold are not expected to change their votes, Democrats now need all of those Republicans to maintain their position in order to defeat a filibuster. However, Brown said Friday he has reservations about the compromise bill House and Senate negotiators fashioned last week and is still reviewing the final version. He said he is concerned about the $19 billion in bank fees added to the bill, the Boston Globe reports. "I was surprised and extremely disappointed to hear that... new assessments and fees were added in the wee hours of the morning by the conference committee," Brown said in a statement to the Globe Friday. "I've said repeatedly that I cannot support any bill that raises taxes." West Virginia's Democratic Gov. Joe Manchin will appoint a successor to Byrd's seat, but it's unclear whether that will happen this week to allow Democrats to schedule a vote on financial reform this week as planned. Democrats were aiming to get the bill to President Obama before their July 4 recess.